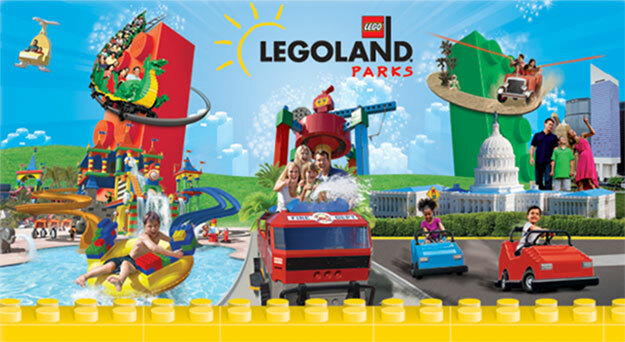 Our highly anticipated day in Legoland, the amusement park built on all those plastic bricks we all love, began with a Gray Line motor coach ride up the Pacific coastline from our hotel near Los Angeles to the park. Here’s a travel tip; save time and money by purchasing your tickets online and using the exclusive coupons from Trusted Tours. We were two 2 adults and 3 kids, ages 4,6 and 9. All of us have played with Lego’s. We planned ahead to make the most of our day. With over 60 rides, attractions and shows, there was a lot of ground to cover. The challenge was finding rides with age and height restrictions the 4-year old could meet without minimizing the experience for the older kids. If we picked a ride the older kids liked, we simply found an alternative experience for the 4-year old to do at the same time, accompanied by one adult. We also decided to skip the water activities that required a swim suit or getting soaked. Save that for another day. The LEGO Wow! factor began as we entered, encountering huge, red Bronte looming over us. The skill and time that went into building this massive dinosaur was amazing. You can meet the people who create the LEGO participants in the Model Shop. We kept the dino theme going on Coastersaurus Ride. It had thrills and LEGO dinosaur appearances. Safari Treck was for 6+only, so the 4 yr. old couldn’t go. We took him to Flight Squadron instead. He had a a great time flying a biplane. The 9-yr. old thought it was cool to drive a Jeep through LEGO wild beasts on the safari. We passed on the popular Sky Cruiser and Kid Power Tower because of long lines, opting instead for Skipper School which got us out on the water. The kids loved it! Our first introduction to Miniland USA was at Star Wars, which the kids really liked. We walked by all the Miniland areas, created to scale with LEGOs – 20 million of them! Amazing. The kids liked it; the adults really enjoyed it. After all that looking and walking, it was time for another activity. We chose the thrills of Knights’ Tournament. It was a good choice. The Dragon Coaster was fun, but Technic Coaster was too wild for the adults and it was another 6+ ride. We passed. Our 9 year-old pleaded to play games in Xbox WB Games Family Game Space. While a bit out of the LEGO mold, the kids really liked it and had a good, competitive time. Throughout the park, we popped into other attractions as we came upon them, stopping to snack and browse the shops along the way. We walked a lot. We had fun. The kids slept on the motor coach on the way back to the hotel. We’ll go back. Next time, we’ll try the water park.